The Financial Ratio Report provides a useful resource in both charting the performance of your organization and comparing it's various financial components over a given period of time. It displays four primary categories that measure business liquidity, activity, profitability, and leverage. 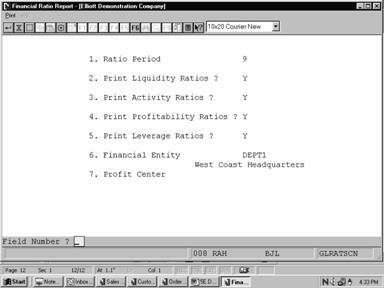 Each of these encompasses a group of ratios, derived from account information posted to the General Ledger File, according to the ratio type you set up in the G/L account file. Before continuing further you should understand that even though ratio analysis is useful it has some limitations. Ratios are calculated with accounting data that can be affected by such variables as methods of depreciation and inventory validation. The interpretation of this information can vary among firms using different accounting procedures. You might want to seek the advice of a financial consultant in clarifying the trends suggested by this report. Note: Due to the nature of the Ratio Calculation, both Year To Date and Current Period values will be calculated using the same data. The calculation for Gross Profit on Sales will be the only ratio calculated differently for the Year To Date and Current Periods. 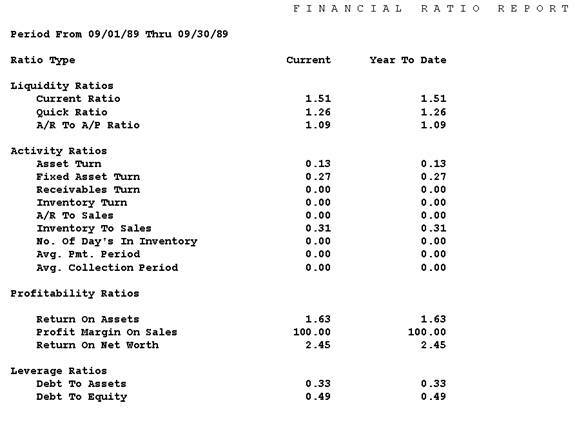 Averages are used to calculate Activity Ratios, and affect Balance Sheet type accounts. Average Value = (Ending Balance for the Last Fiscal Year + the sum of all of the Ending Balances for the periods up to the Current Period) divided by the number of periods being evaluated plus one. The denominator or periods are incremented by one to account for the Ending Balance for the Last Fiscal Year added to the numerator. BBF = The Ending Value of the Last Fiscal Year. An annualization of a balance is used for P&L type Accounts and BSNI (Net Income). It is used to forecast an annual value based on the known activity through the current period being evaluated. The Ending Balance for the Current Period divided by the period number that you are in multiplied by the number of Periods in the Period Account File. EB(CP) = The Ending Balance for the Current Period. No. of Periods = The number of periods that are in the Period Account File. From a statistical standpoint, using an annualized amount for ratio calculations generates more meaningful ratio data throughout the year. This Ratio data should be considered an interim value of the projected Year End performance. Assuming that the Period Account File has 12 Periods and the Current Period is Period Number 3. There are four groupings of ratios displayed. They include Liquidity, Activity, Profitability, and Leverage ratios. Liquidity ratios measure your organization's capability of meeting its short term obligations. For example if your company has a sufficient amount of liquidity, it can take advantage of new investment opportunities and respond to a crisis. Measures your organization's ability to pay it's current liabilities from cash, cash equivalents and inventory. Current Assets CA are equal to the sum of the Ending Balance for the Current Period for Cash C + Receivables R + Inventory I + Other Current Assets CA. Current Liabilities CL are equal to the sum of the Ending Balance for the Current Period for Payables P + Other Current Liabilities CL. This is a more rigid measurement of liquidity than the current ratio. It measures your ability to pay current liabilities with cash and receivables or "Liquid" cash equivalents. Quick Ratio = (C + R + CA)/ CL. Indicates whether your company is receiving more money than it is paying out. A/R To A/P Ratio = R/P . Activity ratios can be considered as a gauge that measures the amount invested in assets by your business relative to the revenue generated by those assets. Calculates how effectively your business is employing its total assets to generate sales. The Sales S value is annualized. For a complete definition and calculation of annualization, see the Application Overview. Cash C + Receivables R + Inventory I + Current Assets CA + Property, Plant & Equipment E - Depreciation D + Other Non-Current Assets OA. Measures how effectively your business is using its property, plant and/or equipment to generate sales. Indicates how successful your business is at collecting receivable accounts or how many times your receivables turn over per year. For a complete definition of the Average Calculation, see the Application Overview. Calculates the number of times that inventory was sold and replenished during the last year. The Cost Of Goods Sold CS is annualized. For a complete definition and calculation of Annualization, see the Application Overview. Measures the percentage of your total sales where payment was not received at the time of the sale. Measures the percentage of inventory levels relative to sales. Measures the typical number of days that inventory is in stock. This ratio coincides with the Inventory Turn Ratio. For a complete definition and calculation of Annualization, see the Application Overview. Measures the timeliness in which your business pays its bills. An estimate of the average length of time your business will wait to receive payment after making a sale. Coincides with Accounts Receivables Turn. Profitability Ratios measure your rate of success in generating sales over a given period of time. This ratio is also termed the rate of return on investment. It measures your organization's net income, to total asset investment. The BSNI value is annualized. For a complete definition and calculation of annualization, see the Application Overview. Total Assets TA is the sum of the Ending Balance for the Current Period for Cash C + Receivables R + Inventory I + Current Assets CA + Property, Plant & Equipment E - Depreciation D + Other Non-Current Assets OA. Enables you to discern the percentage of gross profit for each dollar of sales. CS = Cost Of Goods Sold. This ratio measures your firms net income to its total net worth. Total Liabilities TL is the sum of the Ending Balance for the Current Period for Payables P + Other Current Liabilities CL + Long Term Liability OL. Financial Leverage ratios measure the amount of financial burden placed on your business by it's debts. Calculates the percentage of your total assets that are financed with creditors money. Contrasts your firm's total liabilities to the amount of equity. Retained earnings RE + Common/Preferred stock ST + Other Equity OE + BSNI. 2 numeric characters. Enter the period number that you want considered in the report. This number must be on file in the Account Period File application. Y or N. Enter Y to display liquidity ratios or N to decline. This field defaults to Y.
Y or N. Enter Y to print activity ratios or N to decline. This field defaults to Y.
Y or N. Enter Y to print profitability ratios or N to decline. This field defaults to Y.
Y or N. Enter Y to print leverage ratios or N to decline. This Field defaults to N.
5 alphanumeric characters. Enter a valid financial entity number present in your Financial Entity File. The entity description will then automatically display. If you want to skip this field, press RETURN. 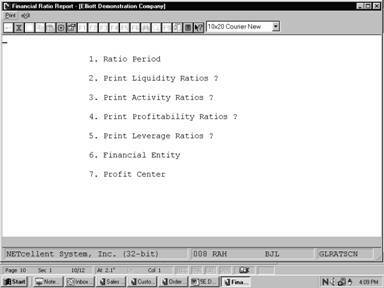 A standard profit center number in the standard profit center number format. If your company does not use profit center, this field will be skipped. Press RETURN to default to All profit center. If a non-blank financial entity was entered above, the entry of this field will be skipped.